It is becoming more apparent that social media provide brands, especially those in the hospitality industry with many advantages and there is a growing need to have an active presence online to draw in audiences to your brand. Social media works well in all industries, and venues in particular, such as event spaces and restaurants can boost popularity by integrating social media into their marketing strategies to drive walk-in traffic as well as increase event bookings. 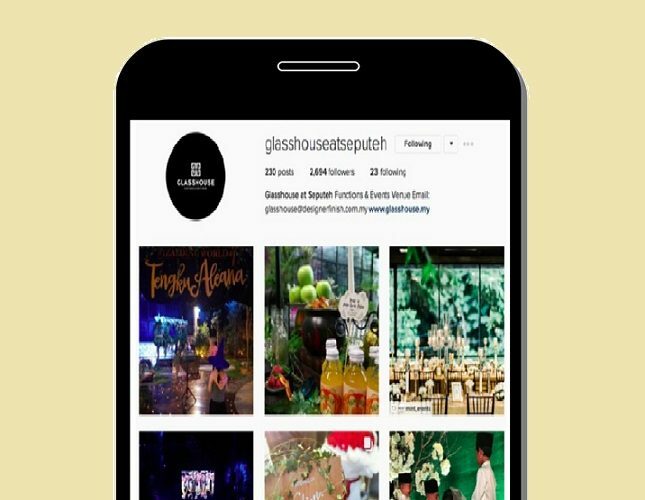 When it comes to restaurants, bars and food and beverage outlets, it is best to stick with Instagram to let the photos speak for itself. It is an essential platform for venues to showcase and display their space and food as an ideal venue space for celebrations and events. With platforms like Facebook, you can immediately see what is being said about your establishment under the reviews section and the check in feature translates into free advertising for your place deeming social media a marketing channel that has revolutionised advertising and promotions. Good reviews give first-time customers the confidence to not think twice about dining or holding an event at your place. Before signing up for every social media platform, understand and study your target audience. What age group do they belong in? What is the nature of your business? Are you targeting businesses? If so, opt for LinkedIn or Google Business. It is always about knowing your consumer behaviour to understand their buyer behaviour. 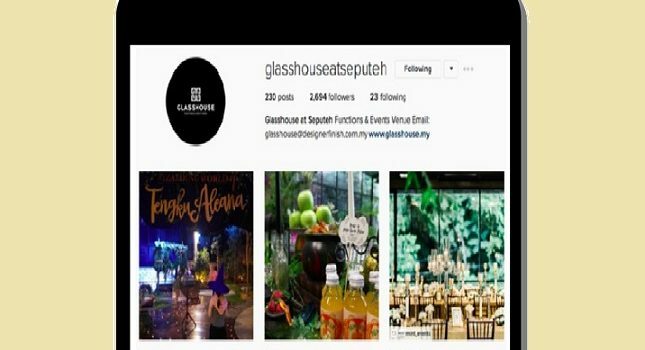 Glasshouse at Seputeh uses Instagram to display past event photos. The idea here is to create articles, capture images, and produce videos that will intrigue your audience. People are better at remembering what they saw instead of what they read and creating videos is the way forward. If you have a marketing budget, engage influencers with a high following on social media to review the food or post up pictures of your establishment. While it may sound simple, creating engaging images and videos require marketers to think out of the box, and do not worry if your first few posts, images, or videos do not check out. Continuously experiment with new platforms and new forms of content to discover what truly works for your establishment and which converts into actual purchase intent. At the same time, curate content which is relevant to your brand from websites like BuzzFeed and Tumblr. Share your content across all social media platforms to amplify your reach. Take time to understand which platform performs the best and brings in most engagement. Utilise Facebook’s targeted ads to increase your reach. Boosted posts reach a larger number of people and Facebook allows you to serve your ads to specific people with its targeting options. For such a small sum of money, the reach may surprise you. It is important to customise your content for each platform as a one-size-fits-all may not be the best way to go. Junior Chellapa in Kuala Lumpur using Facebook to promote their new dish. Building a following on social media platforms require effort and proper management with a clear set of objectives and goals in place. Great content can build you a following like no other and once you have achieved that, it is time to give back to your followers with a campaign, contest, or a straight forward giveaway. Facebook has got you covered as you may run contests easily. This cost-efficient marketing tool can increase awareness if done right. Have a social media strategy for the year in place and be sure to capitalise on major events such as Ramadhan, Deepavali and Christmas to name a few. However, it is important to be consistent with regular postings and interact with your audience if and when they do as responding to comments in a timely manner will score your brand brownie points. Another great idea is to start a blog as content marketing can increase organic search traffic, generate more leads, as well as provide your audience with valuable information pertaining to your venue. The idea is to create content that is informative while promoting your establishment. Do not just stop there, always use social media to support other marketing initiatives including in-venue promotions and events held at your venue. Create a Facebook event page to further promote your events and promotions. While it may be tedious and time-consuming to diligently update social media platforms, it will benefit your brand immensely. Social media works with all types of industries. The unwritten rule for owning social media is to communicate with your audience by providing engaging and shareable content. Be genuine with your postings and stay credible to build trust and a lasting relationship with your audience.